Does current practice engage students with real writing? 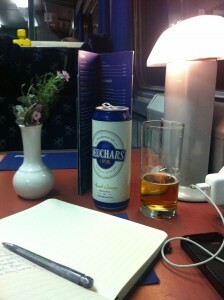 Engaged writing – what If I owned up that one of the best places to write is a long train journey? On board the Caledonian Sleeper. How did you learn to write? I don’t mean the mechanics of holding a pencil, joining dots on a page or copying examples of handwriting. I mean learning to express in writing your own experiences, thoughts, feelings, fears, longings. It’s a question which has haunted me increasingly in my work as a teacher, not least that nagging feeling that too much contemporary classroom practice is probably out of line with the realities of writing as an adult. My own experiences are somewhat hazy. I have vague memories of a blue, green and purple textbook called Mainline English (I seem to recall reaching purple book as being the pinnacle of primary school academic excellence, but maybe that was SMP Maths) and in those somewhat liberal days, there was little idea of whole class teaching. In fact, we merely had to do some English each day, usually at a time of our own choice, gradually working through the book at our own pace. Truly learning to write was a much more imaginative experience. And when it comes to writing, one teacher stands out – Mr Bedford. Naturally, we munched our way through Mainline English, probably marking it ourselves and cheating with abandon. But Mr Bedford was interested in art and to enter his classroom was like being transported into another world, with displays on tribes, the Amazon rainforest, the great deserts of Austrailia, the Polar regions and the history of our village. We made a model of the High Street that filled the length of the classroom (though that project might have been in the equally brilliant Mr Bussey’s class). In fact, in those days I rated the quality of the different teachers in our large primary school on the impressiveness of their displays. Miss Charles (later his wife) was obsessed with history; her ‘weird’ displays (she wore purple tie-dyes) and interest in vegetarian cooking meant she came a close second. 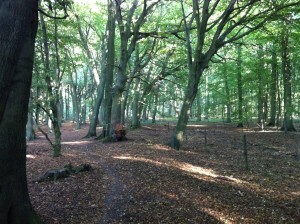 Pity the boring Mr V or Mrs A.
Chinnor Hill – the spot where I was asked to imagine I was a bodger. The point is that writing began with imaginative engagement. We walked up Chinnor hill, wrote poetry in the woods and imagined what it was like to be a bodger (a sort of beech tree woodsman, unique to the Chilterns) and made books for our creative writing (tie-dye covers, of course). Writing seemed to involve a lot of exploring our own thoughts, drafting and polishing and a big focus on nature – describing rocks, noticing details on dried grasses and the obligatory dried teasels in a corner of the classroom. Yes, we also spent far too long making pottery and I certainly don’t recall a focus on ‘powerful words’ or demonstrating an ability to use different forms of punctuation. Instead, we spent a summer term (well, in retrospect it feels like that…) painting the school bus to resemble a house. I was relegated to painting bricks, but never mind – the cat Mr Bedford painted was pretty awesome. When I started teaching, such views were quite out of fashion. Sixteen years later, I couldn’t agree more with the principle of what David Didau terms ‘Making the implicit explicit’. Too often, students who are weaker in writing have struggled with understanding the mechanics of writing. Linguistic analysis of texts has – in moderation – the ability to open up the ways in which words work. And poets – particularly T.S. Eliot who was fascinated by phonology – have also been interested in such analysis. The wise teacher knows punctuation cannot just be caught; someone, as well as a textbook, must do some teaching. Likewise, understanding how a clause works is rarely caught – again, someone must explain – and for this I owe an enormous debt of gratitude to my A level Latin teachers, even if I found the whole experience exceptionally difficult. But somewhere along the line, we’ve lost something. Scaffolding is perhaps one of the best examples of this in action. As an approach to the teaching of writing, it grew in popularity with the introduction of the Key Stage 3 National Strategy under New Labour. Teachers were to make writing an active process, explaining the thinking and planning behind writing and working together on writing with students. As such, it’s an excellent approach, drawing on the best of Vygotskian notions of co-construction. Writing frames were the panacea for all the ills of pupil writing. Teachers began to use them across different age groups, from the earliest years of primary school through to even Sixth Form level. However, what began as a perfectly legitimate way of helping pupils begin their writing, particularly the mysteries of formal essays, became a straitjacket, accompanied by a plethora of model essays, and often came without choice: paragraph 1 will begin this way, paragraph 2 this way and so on. Rather than liberate and empower students, too often such strategies have actually disempowered self-expression and negated different perspectives. The awkwardness of starting may have been eased, but many pupils struggle to sustain writing, while it’s hard not to see that writing for many children is increasingly formulaic: we can all spot the child who has been earnestly taught by his or her primary school how to use ‘short sentences’ to effect. There are, of course, big differences between genres of writing. Non-fiction is often based on a more explicit (and arguably more limited) set of conventions and usually doesn’t come ‘naturally’ in the way that story telling seems almost hard wired in the human mind; I struggle to think of a less natural genre than writing a literary essay. But stories taught by numbers? Has teaching writing simply become an endless diet of ‘connectives’, ‘conjunctions’ and ‘sentence openers’? Half the phrases offered (‘In addition to this’ leaps out) are so cumbersome as to make any writer with an ear for style wince. Too often, I’d suggest, the teaching of ‘literacy’ in its functional sense is conflated with the teaching of English, which is a much more subtle discipline. A number of observations by writers I’ve admired for several years have added to my unease. First, Andrew Motion, speaking at Hughes Hall in Cambridge about the poetry of Edward Thomas, recalled how for him it was the experience of reading Wilfred Owen then Keats as a teenager which drew him into poetry; until then, Motion had little interest in literature and was not particularly bookish. Second, I recently heard Robert Macfarlane (author of the superb accounts of walking The Old Ways and Wild Places) describe at a Guardian Review event his own writing process. Macfarlane confesses to being a slow writer and writes retrospectively, but while walking will make notes each day which he sees as ‘cairns’, signposts to help him with later writing. Motion’s experience – I’d suggest – demonstrates the importance of experience and imaginative engagement, neither of which are particularly radical suggestions but are too rarely discussed by teachers; Macfarlane’s way of writing is again, hardly revolutionary – but it suggests that writers find different ways of writing, and that writing is reflective and sometimes slow; I’d be interested to read research into this notion within writing. Indeed, most pupils are fearful of writing being slow or are scared of the idea that their heads are full of jumbled ideas and they don’t know where to begin. Welcome to the world of trying to write as an adult. Perhaps that leads to where I’m heading with writing. It cannot be reduced to a series of neat formulae, however much we might try as a teacher. Connectives, conjunctions, sentence starters all have their place but they can only be one small part. Perhaps more important is for us to introduce students to writing as process and a set of choices and above all to reclaim the centrality of imaginative engagement. It’s true that few students will go on to be published poets or renowned novelists. But many will use writing for their living, even if only a handful are journalists or similar. Self-expression and creativity touch upon the essence of what it means to human, and if we narrow our curriculum to yet more persuasive letters, we impoverish the development of our students. English teachers should be writers. We scoff at the notion of teachers of English who don’t read or who never see plays. Let’s take this a step further. How can we honestly teach something we last did ourselves ten or more years ago? Make time as an English teacher to write, even if it’s ‘only’ keeping a journal or blogging occasionally. Write for your church, club or society magazine – anything that enables you to be a ‘real’ writer. The more we write, the more we are reminded of the complexities of writing, and the difficulty of reducing writing to rules. Writing for me is about a relaxed and free running mind, excess coffee, scribbled notes, walking while absorbed in the landscape, ideas running around my head, frustration, insomnia and abandonment of time. It happens best when I’m on long train journeys or after several hours of failure. It never involves a writing frame. Want 500 or a 1000 words by next week from a class – when did you last have to try that? Students need to see that writing involves choice and experimentation. Talk frankly about the writing process and the thinking involved. And don’t suggest it’s easy or can even be easy. It isn’t. I frequently write timed essays or undertake the writing task my students are undertaking in class, then discuss how I went about it. Even simple ‘shorter’ writing tasks at GCSE can be stretching for me as a teacher. Some days, I’ve failed as a writer and my writing has come to nothing. Be honest about this. Let’s treasure the imaginative and reflective. When were your pupils last given the freedom to ‘write a story’? Again, let’s remove the straitjacket and give pupils – even just occasionally – the chance to write about what they want to. No one ‘told’ me to write this post. Real writing comes from within. Remember that examples of writing are just that – not models. Many great writers begin with imitation (Graeme Greene modelled his prose on Robert Louis Stevenson who in turn modelled his on Sir Walter Scott) but it doesn’t end there. Writers must form their own voice and their own ways of working. Find time for extended writing. By that, I mean whole books, written by pupils. Writing poetry encourages both reflection and imagination but it also forces students to engage with metaphor, symbol and form. Give opportunity for writing which enables a sense of voice to emerge. Where is there choice in the writing which takes place in your lessons? Writing is both functional and creative. Too often the functional – the punctuation and spelling, the easily measurable – takes precedent. Stress the creative, make the writing engaging and the functional becomes easier and more worthwhile. Controlled Assessment is an aberration which has done much to destroy the crafting of writing. Reclaim planning, drafting and refining. Of course, I’ve said little about the later years of secondary school, when rigour is needed to learn how to construct a formal argument, nor have I explored the phrasing of sentences to ensure precision of expression, and any critical eye will find a thousand other points I’ve failed to mention. There is always much more to say and there isn’t room in one post to cover it all; teaching about where we write and the physical act of writing (notebooks, typing, handwriting and what not) definitely need more exploration But perhaps in the meantime, in the next school year, the pendulum might swing back to experiencing some of the joys, frustrations and openness of genuine writing.